At least one woman was arrested Tuesday for “rebellion” and “terrorism” in a probe of pro-independence activists in Catalonia who have staged protests such as road blockades, the interior minister said. “There is one arrest, a woman,” Juan Ignacio Zoido told Spanish television. The activist groups, called the Committees for the Defence of the Republic (CDR), reacted angrily on Twitter, calling for an immediate demonstration. Spain’s National Court, which deals with major cases including those that are terror-related, is in charge of the probe, said the minister. The investigation targets the CDR, radical groups of pro-independence activists that formed last autumn before an independence referendum on October 1st. “The CDR started to wage violent acts before and during the (independence) process,” Zoido said. On the day of the vote, which went ahead despite a court ban, hundreds of activists posted themselves in front of polling stations. Police dislodged them, sometimes violently. 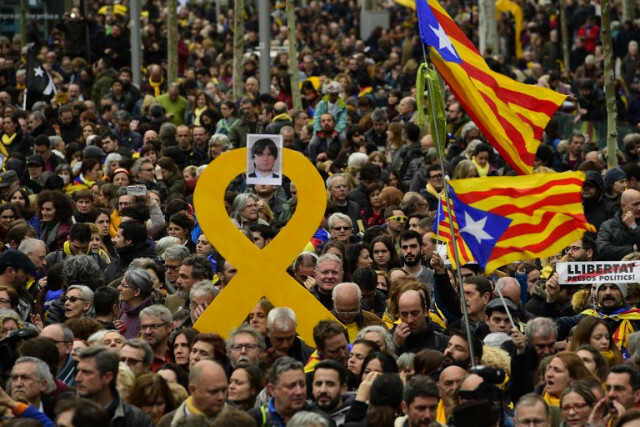 In recent weeks, the groups have protested against the jailing of more pro-independence leaders and the detention of former Catalan president Carles Puigdemont in Germany. The leaders have been prosecuted over their role in a failed bid to secede from Spain last October. At the end of March, the protesters blocked major roads in Catalonia and tried to occupy the central government’s representative office, heavily guarded by police, on several occasions. The resulting clashes left dozens injured. Puigdemont and others have already been charged with rebellion, which carries up to 30 years in jail. The use of this charge has raised controversy as it implies violence took place, which independence supporters and several judges and lawyers say didn’t happen. In Germany, a court ruled that Puigdemont would not be extradited to Spain on a rebellion charge. Zoido maintained there were “detailed reports… showing there were more than 300 violent acts,” in Catalonia, linked or not with the CDR.